A former restaurant, a number of retail units and parcels of land are among the wide variety of commercial and development opportunities available at SDL Auctions Cheshire and North Wales’s auction on Thursday 21 February at Chester Racecourse. 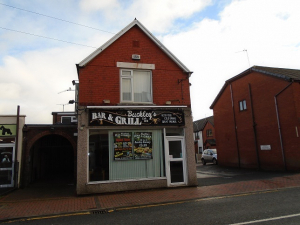 The former Buckley’s Bar & Grill, 14a Mill Lane, Buckley, Flintshire, has been used as a restaurant for many years and has accommodation set over two floors with plenty of parking to the rear. The ground floor features an entrance area with lift access to the first floor, plus a large dining/bar area, rear dining room, and rear entrance/hallway with stairs to the first floor. Upstairs there is a function room, four further rooms, two bathrooms and a bar/kitchen area. The property, which is deceptively spacious and may be suitable for conversion to residential, subject to planning permission, is on the A549, not far from the larger A55, and just two miles from the county town of Mold. It is freehold, with vacant possession upon completion, and has a *guide price of £175,000+. The former restaurant is just one of 103 lots which feature in a bumper two-auction catalogue, which covers the Chester auction, SDL Auctions North West’s auction in Manchester, as well as lots being sold online. Another property which features in the catalogue is Livingstone House, Llewellyn Avenue, Llandudno, a characterful period end-of-terrace currently used as offices but which has development potential, subject to the necessary permissions. The three-storey leasehold property, close to Mostyn Street main shopping district and within walking distance to Llandudno Promenade, is classed as A2 usage for financial and professional services but, with the necessary consents, could be changed to residential use, such as a House in Multiple Occupation. The ground floor currently comprises a reception area, private offices, kitchen, WC and access to the basement, which is used for storage. On the first floor are three offices and two store rooms, while on the second floor there is another large office space, store room and WC. Outside there are three parking spaces to the rear, accessed via Masonic Street. The guide price is £135,000+. A ground floor retail unit in Ruthin occupies a prominent corner position in St Peters Square. South Prior House, which has a guide price of £60,000+, is leasehold and believed to be currently let. It would be an attractive addition to a commercial property portfolio. A busy high street in Wrexham is the location for a mixed-use commercial unit with one-bedroomed apartment above, with a guide price of £128,000+. The freehold property, 24 Ruabon Road, has separate access at the front and rear, and sits on an established parade close to local amenities. It is currently tenanted and features a retail unit on the ground floor, with a first-floor apartment comprising lounge, kitchen, bedroom and bathroom, and a rear yard outside. Further south in Ironbridge World Heritage Site, a freehold plot of land is to be sold with a guide price of £60,000+. Land adjacent to 49 Hodge Bower is in the perfect location for walks in and around Ironbridge Gorge and may be suitable for a variety of uses, subject to the necessary consents. Planning permission was previously granted in 2001 but this has now expired. Debs Latham, head of residential auctions at SDL Auctions Cheshire and North Wales, said: “Whatever your property plans, we have some interesting lots coming up in our first Chester Racecourse auction of the year and in our bumper two-auction, 103 lot catalogue. We are looking forward to getting back into the auction room to sell these great properties and many more. For more information about any of the properties, or to bid on any of them online, click here.